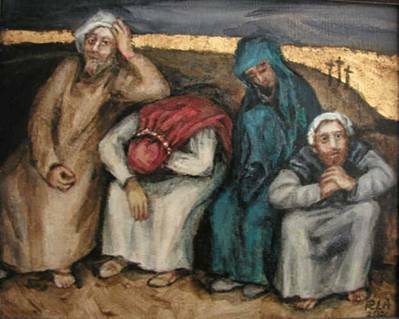 As I contemplate the dark reality of Holy Saturday, I am reminded of the in-between; remaining stuck somewhere between the tragedy of Friday and triumph of Sunday. The problem is I cannot keep my mind in the in-between. As I live this side of resurrection Sunday, I have to try hard to step back and imagine what it must have felt like for the disciples. How dark. How desperate. How hopeless. But I can’t do it. I cannot imagine that place because I know what they did not–Jesus will rise and overcome the dark desperate hopelessness. I know that Holy Saturday is only the in-between. Jesus’ divine surrender led to His redemptive suffering. Today I cannot help but wonder, will I allow His divine surrender to move me toward surrender? Will I live a life of self-giving love even if it means I am to share in His sufferings? Will I carry within me the death of Christ as I share the load of another’s burden? Because I know Sunday is coming I know the divine power that awaits. My Holy Saturday prayer is that I will allow this divine power to lead me to surrendering to the divine so my old self with all it’s self-serving desires can be carried away and crucified that I might receive the divine power of resurrection. I pray you will too, because one thing is sure this Holy Saturday.